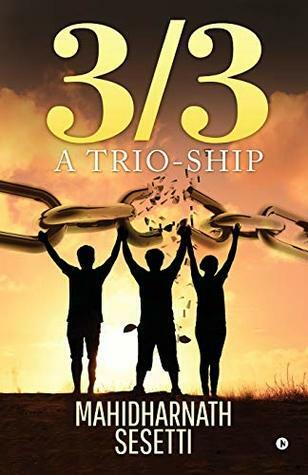 3/3 A Trio Ship by Mahidharnath Sesetti is a journey of three youngsters, Bhadri, Narendra, and Indira. The plot based on college politics and struggle of their day to day life. The cover page and title give a general idea of the main characters, but the broken chains say a lot. I feel the cover page can be improved. Bhadri is a carefree and moody guy. Indira is a protagonist and wants to fulfill his father's dream. Narendra is a brilliant student. He wants to become a collector to change the fate of his village. Three of them meet in engineering college. The first meeting, the ragging part, tech-fest, family issues, the brawl they face, the author covers almost every aspect of their life. The three of them with the help of their friends and teachers ignite a fire of self-legislation in the whole GAT University. The main focus of the story is on fighting for wrong. The author gives insight into student's life where they are the victims of drugs and alcohol but also forced under the expectations of other people. The freedom they deserve is not given. Bhadri, Indira, and Narendra fight for freedom and make the right choices for everyone else. The influential person is accountable for answers, and the author reveals that part meaty. Freedom always comes with a cost, but the question is who will sacrifice for it; Bhadri? Indira? Narendra? Or someone else? The language is simple and easily understandable. But the grammatical errors, spelling mistakes, and improper formatting break the flow of reading. I also felt that the book is stretch unnecessary, and the names of characters are difficult to remember. Mahidharnath Sesetti took an unexpected topic for his debut book. One can connect with the characters. The plot is thought-provoking. The characters grow with a slow and steady pace. The narration is also smooth, and the twist and turns hook the readers till the end. It's a recommendable read. Is freedom a cuss word? If no, can one declare one's opinions or thoughts openly? It would be a tough challenge. But how would it be if three teens, Narendra, Bhadri, and Indira exercised their freedom and endeavor for the changes they envision? How does the trio-ship persevere to pursue it? How and why does one need the other? What do they endeavor to unshackle? The trio-ship is not only the relationship of the three but also their pursuit.